MUSCAT Under the auspices of H.E. Thomas Schneider, Ambassador of the Federal Republic of Germany to the Sultanate of Oman and Eng. Nasser Bin Ali Al Hinai, Director General of Technical Affairs of Muscat Municipality, the exhibition “Public Spaces – Urban Identities in Muscat” was opened today morning at Bait Al Baranda Museum in Muttrah (Muscat). 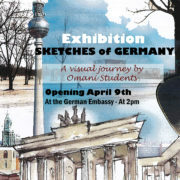 The exhibition is held in cooperation with the German University of Technology in Oman (GUtech). It displays different perspectives of planning public spaces and their identities in Muscat. Tourism research, community-based designs and architectural sketches on Muttrah from students and faculty members of GUtech and partially in cooperation with the Scientific College of Design are on display. The main topics of the exhibition are: “Observations and drawings of Muttrah”, “Community–Based Design in Muscat”, “WOW — Where Oman Walks” and “Mega-cruise tourism and its impacts on the local community in Souq Muttrah”. 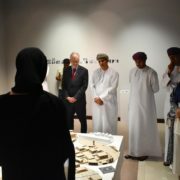 The opening of the exhibition included talks on the development of urban spaces followed by a panel discussion with experts from the academia and the public sector in Oman. H.E. Thomas Schneider stressed in his welcome address, the importance of involving the local community in urban planning processes in order to create places that enhance networks within the community while respecting their everyday needs. Prof. Dr. Gustavo di Siqueira, Head of the Department of Urban Planning and Architectural Design (UPAD) at GUtech said that Muscat has witnessed a rapid urban development since the 1970, focusing on basic infrastructure and a car-oriented network. In their student project he focused on how the community perceives the walkability of certain areas and their suggestions for further improvements, e.g. in Al Khoud and Al Khuwair. Prof. Gazmend Kalemi, UPAD Department and his students display their sketches on Muttrah in the second part of the exhibition. “Drawing expresses our impressions and observations. The more you draw, the more you see and observe the tangible environment,” said Prof. Gazmend Kalemi, UPAD Department at GUtech, while adding that future architects need to have a basic knowledge about space and its aesthetics. Referring to the student and academic work on display, Malik Al Hinai, Director of Bait Al Baranda Museum said: “You created a special story that visitors will see in the coming week – urban spaces, walking spaces are on display for the community”. During the discussion, the architect and urban planner Hilal Al Busaidi from Muscat Municipality said that he and his team have realized that the community is very willing to participate in public discussions. “We try to include the community in the planning and policy-making process,” he said. Shela Hussain and Mahmood Al Wahaibi from the Supreme Council of Town Planning, who are involved in the preparation of the Oman Vision 2040 and the Oman National Spatial Strategy Project, said that the use of ethnography is very important in exploring social values and personal experiences of space. “Especially in tourism, the charm of the country lies in authentic spaces,” said Mahmood Al Wahaibi. Referring to the walkability of spaces, one of the female GUtech UPAD students in the audience stressed that public spaces are rather male spaces and that it needs a general mind-shift. Currently, it is difficult and challenging for females to walk on their own in public. Dr. Manuela Gutberlet, academic researcher and PR Manager at GUtech showcases some of her ongoing academic research on the impacts of mega-cruise tourism on local life in Muttrah. In her talk she mentioned that in particular overcrowding, a marginalisation of the local well-established community and culture shock situations have triggered a silent resistance from the Omani business community and the residents. In addition, an increase in cheap imported souvenirs and social dumping of the labour force were observed. “The space along the corniche road and the main street in Souq Muttrah has developed into a ‘tourist bubble’, focusing on the needs of the mass tourist. My survey shows that most of the cruise tourists consume the place visually; they do not buy anything or very little in Souq Muttrah. Research conducted in other cruise destinations worldwide support these results. To increase the quality of life of the local community, she recommends to limit and control the number of cruise tourists arriving in Muttrah and to introduce a tourism management strategy. The organizers of this special opening event wish that the workshop serves as a kick-off event for a continuous discussion on urban spaces and their identities, for the benefits of local communities in Oman. The exhibition “Public Spaces – Urban Identities in Muscat” at Bait Al Baranda is open until 1st of May, from Saturday to Thursday between 9 am to 1 pm and 4 pm to 6 pm. HALBAN With increased urban development worldwide and here in Oman in particular in the capital area, eco-friendly and energy-efficient houses are a timely and relevant topic to address. To advance an efficient knowledge transfer between the research institutions and the public, the GUtech EcoHaus project, led by Prof. Nikolaus Knebel held an Open House event recently. During a three-hour session Prof. Knebel showed and explained his latest building designs, which elaborate on the experience from the EcoHaus project and the concurrent research done on it. The housing projects discussed with the visitors were villas and a multi-storey residential project. “Despite pioneering works through the TRC-funded five eco houses built in 2014, the knowledge about how to approach such a DESIGN task needs to reach out to home owners and architects even more.” said Prof. Knebel. Therefore, home owners and builders were invited to participate in the session and present their projects and plans followed by a discussion with Prof. Knebel and GUtech students about how to improve the designs and selection of construction materials to reach a more energy-efficient and eco-friendly architecture. “The open day of the EcoHaus was great, the visitors were excited and curious. We showed them around the house and discussed proven strategies for recurring problems in our GCC region. It was insightful for the visitors but it was also great for me as student to revisit important concepts regarding renewable energies. I think it is a great idea to hold regular open days for the public and especially for school children,” said Ammal Al Kiyumi, UPAD student at GUtech. “Circular Approaches” is the title of a Spring 2019 Public Lecture Series offered by the Department of Urban Planning and Architectural Design at GUtech. Tomorrow’s public talk at 1.30 pm, held by Dr. Arnaud Evrard, who is a researcher, educator and earthen builder. 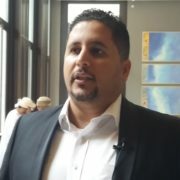 He completed his doctoral studies in 2008 from the Ecole de Polytechnique de Louvain in Belgium focussing on the thermal properties of Lime-Hemp material. Prof. Arnaud’s talk will focus on circularity at the material level. Since 2016 he has worked as a builder for the rammed earthen pioneer Martin Rauch. He currently teaches at the ‘Architekturwerkstatt’ (Architecture Institute) in St. Gallen. The ‘Circular Approaches’ presentations deal specifically with how architects, builders and educators are incorporating circular strategies into their work. “With the consequences of energy scarcity and global warming already upon us, the relevance of Circular Thinking in Oman is quite clear. As architects, we are responsible not only for proposing Approaches for these challenges, but seeing them as possibilities to innovate and elevate our practice” said Prof. Wayne Switzer from the UPAD Department. The idea of circularity can be traced through many philosophies and belief systems and has over time also become a way for a society to understand aspects of their culture – from the economy, agriculture and environmental health. This concept, of continuous feedback and renewal, emphasizes a comprehensive view on our existing and finite resources. Within the field of architecture and construction, this means separating building from the consumption of limited resources and from processes which are harmful to humans and our environment. Circular building reimagines this process as a regenerative loop: buildings which are made from existing or recycled materials, buildings which produce energy and filter water, buildings which can be disassembled or re-purposed after their initial usage has changed. MUSCAT A sketchbook is a common possession for architecture students worldwide. The Department of Urban Planning and Architectural Design (UPAD) of GUtech will showcase a large number of student works at the German Embassy in Muscat on the 9th April 2019 at 2 pm. In November last year, a group of twelve UPAD students and Prof. Gazmend Kalemi conducted a field-trip in collaboration with Beuth University in Berlin and RWTH Aachen University, GUtech’s partner university in Germany. The study tour was sponsored by the German Academic Exchange Service (DAAD). “Drawing is a vibrant way of engaging with people and our natural and built environment. During the excursion, we followed the long tradition of travelers attempting to capture different places and atmospheres with their pencils and sketchbooks, collecting visual experiences and to bring them back to their home countries,” said Prof. Gazmend Kalemi, who initiated and supervised the two-week field trip. He added that the importance of advanced design software cannot be denied, but so-called free-hand drawings are essential to understand the environment. “While drawing, we spend considerable time in the physical field to enhance our perception and memory. Drawing involves internalising the object, feeling it in our being and starting a dialogue with it. It is, of course, a way of thinking with the hand,” said Prof. Gazmend. Appreciating the students’ and professors’ efforts, the German Ambassador to Oman, Thomas Schneider, emphasized the vivid partnership between Germany and Oman: “Not only does our Embassy building itself stand as an example of a successful Omani-German partnership in the field of architecture – projects such as the exchanges between GUtech und RWTH Aachen contribute to lasting, lively relations between people as well as between institutions”. The students’ first destination was Berlin, Germany’s capital, located in the north-east of Germany, with a population of 3.6 million inhabitants. “Berlin is well-known for its rich history and architecture. It is a treasure to observe and draw. The arts scene and its diversity are significant and a magnet for young people,” said Prof. Gazmend. The group visited various historical sites, where they experienced how the old meets the new architecture, such as Alexanderplatz, Museumsinsel and Reichstag. The group also worked together with students from Beuth University. In spring 2016 students from Berlin, supervised by Prof. Gerd Sedelies, had visited GUtech and various sites in Oman producing beautiful sketches. “Now we have spent time working together and exchanging our experiences in Berlin. Another highlight was an invitation to Oman’s Embassy in Berlin where we enjoyed Omani hospitality and generosity. At RWTH Aachen University we worked intensively on a small urban design project, experiencing the morphology and the urban identity of the city and its surroundings, which is very different from Muscat. Of course, for Omani students the diversity in culture, people and life in Germany and in Europe was a new and challenging experience. I think after this trip Germany and European culture will be viewed differently by our students and this will reward them both on a personal as well as a professional level” said Prof. Gazmend Kalemi. 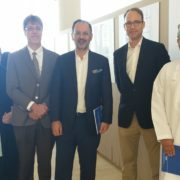 The students and Prof Gazmend extend their thanks to the German Embassy in Muscat for showing their sketches at the Embassy. They are also grateful that the German Academic Exchange Service (DAAD) provided them with the opportunity of a memorable drawing and sketching experience. If you wish to attend the opening of the exhibition on 9 April, please register by e-mail to L-vz1@mask.diplo.de or by phone call to 2469 1218 ext. 819 with your name, e-mail address and/or mobile number. HALBAN Under the auspices of Farrokh Derakhshani, Director of the Aga Khan Award for Architecture, the Department of Urban Planning and Architectural Design (UPAD) of GUtech has opened a special photo exhibition about the Aga Khan Award for Architecture on campus today. The exhibition has been sponsored by Argan Towell. “Architecture is an approach to solve a problem,” said Farrokh Derakhshani, Director of the Aga Khan Award for Architecture, in his opening speech while adding that architecture is a way of changing and impacting the life and well-being of people. He has been associated with the Award since 1982. Farrokh Derakhshani trained as an architect and urban planner at National University of Iran and later continued his studies at the School of Architecture in Paris (UP1). His main field of specialisation is contemporary architecture of Muslim societies. He has served as a jury member at various international competitions, schools of architecture and collaborated on a large variety of publications on architecture. Some of the awarded architecture and urban planning projects that are on display in the exhibition are the ‘Issam Fares Institute’ in Beirut (Lebanon), ‘the Superkilen’, a public space in Copenhagen (Denmark), the Friendship Centre in Gaibandha (Bangladesh), a rural training centre inspired by an archaeological site and the Tabiat, a pedestrian bridge in Tehran that connects two urban parks. “This exhibition shall inspire students to submit and participate in an architecture competition,” said Prof. Nikolaus Knebel from the UPAD Department. The Aga Khan Award for Architecture has been given to a total of 116 projects since 1977. The award is given every three years to projects that set new standards of excellence in architecture, planning practices, historic preservation and landscape architecture. Through its efforts, the award seeks to identify and encourage building concepts that successfully address the needs and aspirations of societies across the world, in which Muslims have a significant presence. 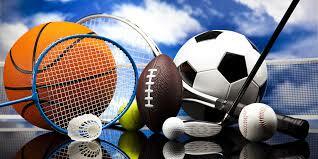 The current prize fund is a total of US$ 1,000,000. The exhibition at GUtech is open to the public and will run until April. HALBAN To highlight the successful development of the German University of Technology in Oman (GUtech) over the past decade, Prof. Nikolaus Knebel, one of the founding staff of the Department of Urban Planning and Architectural Design (UPAD), published a book to summarize his approach to educating architects and urban planners in Oman. 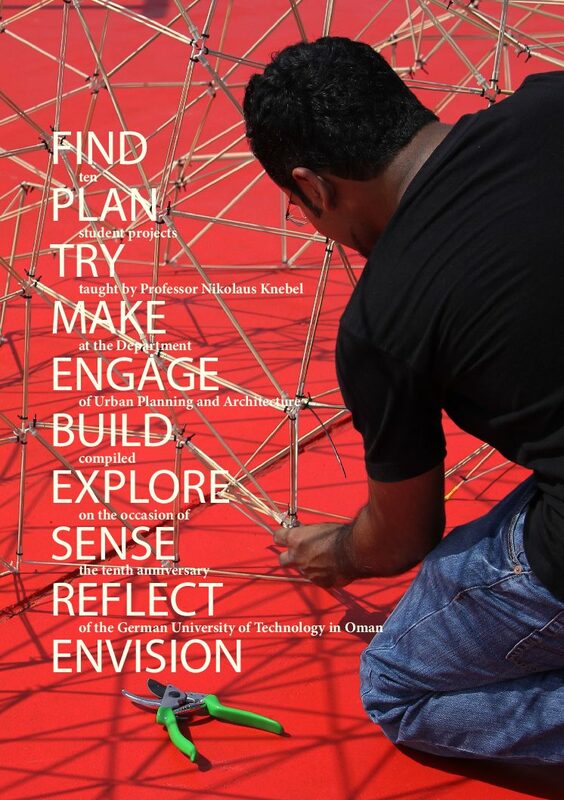 “While the professional realm of architects and urban planners is still emerging in Oman my teaching emphasizes what is usually rather at opposite ends of academic education, namely the real and the theoretical.”, said Prof. Nikolaus Knebel. Prof. Knebel’s book on “Ten Projects on Educating Architects in Oman” is currently presented at the Muscat International Book Fair, Oman Convention and Exhibition Centre. The book discusses ten study projects, each characterized by a verb that stands for the main activity: find, plan, try, make, engage, build, explore, sense, reflect, envision. One set of projects aims to expose students to primary experiences that are relevant for architects and urban planners, such as working with real materials and real sites, e.g. when students learn how to mix mortar, lay mud-bricks in a bond, ram earth, use natural stones, cut and join timber, and test palm leaves as a roof cover. “With that hands-on experience of using different tools, handling materials and understanding processes on site, students then set out to design a new prayer room for GUtech’s sports facilities,” said Prof. Nikolaus Knebel. 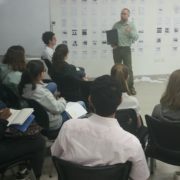 Students also meet with professionals from the consulting and construction industry to get to know the everyday problems that architects and urban planners face while doing their everyday work. Projects such as the award-winning EcoHaus, the research into the Social Housing Project, the setting up of a building yard on campus are preparing students for their future jobs. In another set of projects Prof. Nikolaus Knebel focuses on continuously building up the students’ theoretical knowledge. “Our projects like the experimental design workshops with the Architectural Association in London and my emphasis on reading and discussion key theoretical texts during our excursions to the UAE and Qatar in recent years or in seminars on Design Thinking aim at nurturing a fundamental knowledge that underlies architectural practice regardless of the fashion of the season,” he said. “Throughout the past years we visited different projects in Qatar, UAE, Germany, Belgium and the Netherlands to understand the practical and theoretical challenges of current topics such as identity, community, mobility, energy and digitalization. 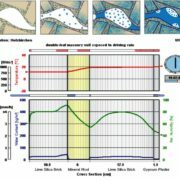 Students saw gigantic new airports and miniature prayer rooms, solar cars and passive energy saving houses, student companies and multinational architecture firms, but they also read the key texts.” Finally through reflection about their own work and skills, awareness is created about the entire design process. “Students become more confident, and thus more agile designers, individually and collectively” highlighted Prof. Knebel. Successful GUtech graduates from the Department of Urban Planning and Architectural Design (UPAD) have moved on in their educational path and completed their Master’s degree abroad, for example in Germany, France, Italy, UK, US, South Korea. Some already embarked on PhD programmes. Many graduates now work as architects in Oman and the region, independently or in the government sector, such as the planning departments of different ministries in Oman, the Supreme Council for Planning in Muscat or with prestigious local consultants such as Khatib & Alami, Atkins, 23 degrees or Hoehler & Salmi Architects. Soon, fresh graduates and professionals can earn a Master’s degree in architecture and urban planning, at GUtech in Oman. Admission into the programme is open and scholarships are available. HALBAN As part of an integrated project, entitled ‘Botschaft-Bauen’, in English ‘Embassy building’, a total of 44 students of the Department of Urban Planning and Architectural Design (UPAD) planned and designed a new Turkish Embassy building during the winter semester. The group of UPAD students included four German exchange students from the University of Applied Sciences in Buxtehude and from RWTH Aachen University, who are currently studying at GUtech. “I am very much impressed of the projects inspired by the Turkish architecture, houses, and the culture like the evil eye, the whirling derwishes or the Turkish yali, a mansion beside the waterfront. I would like to congratulate all students,” said H.E. Ayşe Sözen Usluer, Ambassador of the Republic of Turkey in Oman. The Ambassador attended one of the presentation sessions. First Counsellor at the German Embassy the creative ideas as well as the technical skills of the students are impressive. It was a pleasure to discuss the designs with both the students and their professors. Kudos to GUtech for producing such quality!” said Joachim Düster. During the initial phase of the course the students and their professors discussed different aspects of Embassy buildings. “An Embassy is a representation of a nation, a symbol for cultural exchange, a place of refuge for citizens and it is like an island, isolated from the rest of the city,” said Prof. Ercan Agirbas while Prof. Wayne Switzer of the UPAD department added: “An Embassy is a place and at the same time an Embassy means building diplomacy with another country. On the one hand an Embassy is the face of a nation and on the other hand this representation must be balanced with real issues of security.” To learn more about the design of different Embassies in Muscat, the group visited the German and the French Embassy in the beginning of the semester. For the presentation of their results, all Ambassadors were invited and the cultural attaches from France, Turkey and from the German Embassy attended different sessions where the students recently presented their final results. In addition, the students also traveled to Istanbul last semester. The excursion was an important part, where they experienced the place in reality. Moreover, the project manager of the newly build German Embassy from Hoehler + AlSalmy Architects, Daniel Schulze-Wethmar attended the sessions. “Each students had 5 minutes to present and 10 minutes for the discussion. Drawings, models and renderings like physical or digital models were presented,” said Prof. Ercan. “We had very diverse projects related to aspects of Turkish culture like the evil eye, domes etc. One design was buried in the ground and another one was floating over a garden. What made every project very good was the level of engagement of the students and how they were committed to the task,” said Wayne. Both professors stressed that “there were many best ideas, for example the most creative ideas or the most rational layout.” Currently, an architecture office is working on the design of the Turkish Embassy, possibly some student ideas will influence their planning process. HALBAN As part of the university’s local community engagement, a group of fifteen international students and two teachers from the French High School in Muscat visited the GUtech campus today morning. They met with different professors from the Department of Urban Planning and Architectural Design (UPAD) and the Department of Computer Sciences (CS). Prof. Dr. Nabil Sahli, Head of the CS Department, gave an introduction to the concept of smart cities and the future of cities worldwide. He also elaborated on smart transportation and the social aspects impacting societies in smart urban developments. Amal Al Balushi and Olivera Petrovic, both from the Department of Urban Planning and Architectural Design at GUtech then spoke about the work and responsibilities of urban planners and they showcased some recent students’ works to the group. After a short tour around the GUtech campus, the group visited the EcoHaus where they met with Prof. Nikolaus Knebel from the UPAD Department (pictured). He elaborated on the architecture design of the EcoHaus and several smart interior design features such as the cooling system, the solid wall insulation and the recyclable building materials. HALBAN To create awareness on electric mobility in Oman and to bring together various stakeholders from the public and private sector, the eMobility Forum Oman was held at the Hormuz Grand Hotel in Muscat today. GUtech was the official Academic Partner of the event, which was organised by GlobalEVRT. The electrification of the transport system is seen as one of the best ways to improve the overall quality of the environment, to increase the air quality and to lower global CO2 emissions. Dr. Oualid Ali, Director of Training and Smart Solutions Centre (TSSC) at GUtech and Founder and President of the Future Cities Council gave one of the keynote speeches entitled “Electric vehicles for future smart and sustainable cities: opportunities and challenges for Oman”. In his talk he mentioned some of the challenges facing Oman, such as the implementation of governmental regulations, the citizen’s adaptation of electric vehicles as well as the infrastructure upgrade including charging stations that need to be set up all over the country. According to Dr. Oualid, there are currently twelve existing charging stations for electric cars between Dubai and Muscat. “The network of charging stations is a very important factor,” said Sam Alawiye, CEO of Green Parking while adding that Dubai has one of the largest numbers of charging stations worldwide. “Our company’s goal is to provide charging stations all over the GCC region along with parking facilities so that it is possible to drive from Riyadh to Salalah within a network of charging stations based in commercial centres and hotels,” said Alawiye. On the sidelines of the event, the participants had the chance to test-drive one of the latest electric car models from Renault, GM, Chevrolet and Tesla. 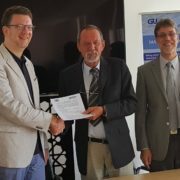 HALBAN The Department of Urban Planning and Architectural Design (UPAD) of the German University of Technology in Oman (GUtech) has signed a Memorandum of Understanding (MoU) with Buxtehude University of Applied Sciences (Hochschule 21) in Germany. The university is specialized in the fields of Building Sciences, Technical Sciences, and Health Sciences. The Department of Architecture at Hochschule 21 offers a four year Bachelor of Engineering programme in Architecture, combining theory and continuous practice at architecture offices for two to three months each semester. “In the frame of an exchange programme funded by the German Academic Exchange Service (DAAD) entitled ‘University Dialogue with the Islamic World’ our universities have been working in cooperation with each other, in the past two years. During that time we conducted a project on the duality of professional practise in architecture. Due to its success we wish to extend and enhance our cooperation in all fields, including student and staff exchange as well as in research during the next five years,” said Prof. Dr. Ing. Karsten Ley, who is an urban planner, architect and the Head of the Department of Architecture at Buxtehude University of Applied Sciences. Prof. Dr. Karsten Ley has been working as a regular fly-in professor at GUtech since the foundation of the GUtech in 2007. A group of twenty architecture students and professors from Buxtehude University of Applied Sciences visited GUtech and a group of GUtech students and their UPAD professors visited the university in Germany last year. Three German students are currently studying in the 5th and 7th semester in UPAD at GUtech. In the next semester three students will conduct their BSc thesis at Buxtehude University of Applied Sciences. “We are looking forward to strengthen our cooperation in the coming years. In the next year a small group of students will conduct their Bachelor thesis at Buxtehude University of Applied Sciences,” said Prof. Dr. Gustavo De Siquiera, Head of the UPAD Department at GUtech. “The project will be applied research and conducted for the Ministry of Environment Schleswig-Holstein in cooperation with two other Universities of Applied Sciences,” added Prof. Dr. Karsten Ley. GUtech students will get some insights and benefit from an international research environment and architectural research practises in Germany. “Our university focuses on application-oriented courses. Therefore the students are well prepared for their professional lives in their field,” said Prof. Karsten Ley. Buxtehude University of Applied Sciences was re-founded as a private university in 2004, looking back at a continuous tradition as academic institution that originally started in 1875. Currently a total of 1,100 are studying at the university, including 200 students at the Department of Architecture. The University is located in the Hanseatic City of Buxtehude, in the greater Hamburg Metropolitan Area and the wider region of the rivers Elbe and Weser in Northern Germany.